Posted May 8th, 2008 by Ms. Jen & filed under art + photography, design + web, writing + blogs. This week Sandra and I are working on an iteration or somewhat-redesign of her Debutante Clothing blog. The other night I went over to her house and used a photo of Justin’s sister to make a big bold splash of a banner header. But by the time I got home and all through yesterday day, I felt it was too bold for the rest of Sandra’s blog and overwhelmed the content. 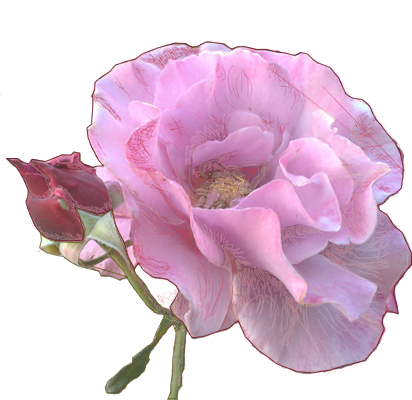 This afternoon, I plugged my Wacom tablet in, turned on Fireworks, opened up the photo of the roses outside of Sandra’s front door that I took on Tuesday evening and started to draw over the photo with colors from her blog. I wasn’t sure if Sandra would like the drawing for her masthead or if she liked our big bold statement, or if I should take the the drawn over roses and weave them into the new masthead I created on Tuesday evening. Flickr Video : What a Tasty Chicken! Posted April 8th, 2008 by Ms. Jen & filed under art + photography, design + web, tech + web dev. About two weeks ago, I received an invitation to join a Flickr beta test. I was intrigued, so I said yes. I had to sign an NDA stating that for the love of a tasty chicken I would not breath a blog, twitter, or in person word that I was beta testing Flickr Video. 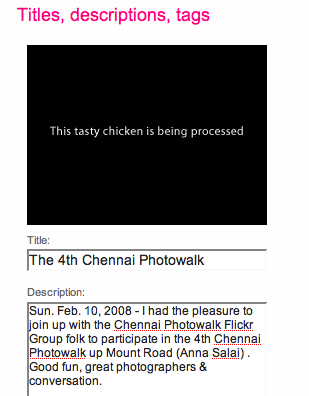 Yes, Flickr can have my silence in return for uploading 60 seconds of various tasty chickens from India, SXSW 2008, and Scruffy & Belle. In all truthfulness, while I appreciate YouTube, Google Video, and Vimeo, I am not drawn into these services. I don’t wait to see what will be posted, I only go when someone else sends me a link. If the video is longer than 5 minutes, I don’t watch, be it too much work or just plain not interested. It has been very different with Flickr Video. I am drawn in. I love the short format of 60 to 90 seconds. As the Flickr folk said – think of it as a long photograph. I also love the fact that I can use the same uploader and same Flickr tagging and interface that I use for photos. The user interface is simple and easy to use and not just because I am used to it. Most of all, I am having fun with video on Flickr in a way that has never been fun before. Thanks, Flickr! Y’all rock. Posted March 9th, 2008 by Ms. Jen & filed under design + web, sxsw, tech + web dev. Sun 03.09.08 – Today is the Big Day. George Kelly and I will be conducting our Web Standards Confession Booth “Core Conversation” in the Ballroom E of the Austin Convention Center at 3:30pm. Posted September 16th, 2007 by Ms. Jen & filed under design + web. While web usability experts and designers decry the horizontal scroll, I believe that it has its a rightful place on the web. I actually love it when an art or experimental site shakes up the convention of vertical scroll by defying our expectations of usage. Design Melt Down also believes that there is a place for the horizontal scroll. Banksy’s use of the horizontal scroll with big huge images of his outdoor work rocks. Then again, Banksy rocks. The page is even named horizontal_1.htm. Posted August 31st, 2007 by Ms. Jen & filed under design + web, tech + web dev. This was not an intro question trying to find out who I was and what I did for a living upon first meeting, but a derisory question meant to belittle by someone who had known me for over a year or two by that time and knew my profession. What the acquaintance was really getting at was who was I and where did I rank in web hierarchy. I am here to tell you that I did not add up in the acquaintance’s book. I did not matter in this person’s world because I had not aggressively carved out a territory to have, to hold, and to defend in the new internet bubble known as “Web 2.0”. I was a bit bewildered by the whole conversation and later it offended my flat hierarchy punk rock ethos. I may have forgotten about it, except it happened a couple of more times over the course of the year with several other professional acquaintances. Since I have finished my Master’s program nearly a year ago, I have felt a great deal of pressure, both internally and externally, to carve out a territory, be it web design for developers or mobile design or mobile practices or … or … I have spoken to / met with 3 tech publishing house acquisition editors about the possibility of writing a book. I have spoken at two conferences and a few university speaking engagements on web design and mobile practices. While I love speaking and teaching, the very idea of writing tech book leaves me cold. My non-existent business manager would have given me a good talking to and possibly a swift kick in the rear, but I don’t care. It is true. I most desire to create. Be the creations art, photography, ideas, web design, a web app, a great meal, a blog post, or a coptic bound handmade book, I want to make things. I want to share ideas. I want be a blessing to others. All the carving of territories that is currently happening in web design & development makes me nervous. No, not really nervous, it makes me shy away. Watching the internet that I have loved so dearly the last 13 years go from a wild place with lots of crazy ideas – a place of innovation and sharing – to a place that is slowing hardening into a place of hierarchy and territories, I want to pull out of it and go paint. Seriously. I have an pdf application on my desktop to apply for a grant for a local studio space for LA area emerging artists. This is not a good response, as in 1994 – 1996 I purposely left the art world and all of its competition for the love of creating web sites. A better response for me now is that while I don’t care about competing for a specific slice of a web territory, I will create regardless. I don’t care if the topics I could write a book on or in an article or speak on are currently or concurrently have 3-4 other higher profile web professionals jockeying for the slot as “The Expert ™”. I will create. And I will share. To this end, I will be blogging more of my ideas about the web design / dev and mobile worlds, not to carve out a territory but instead to celebrate a range of ideas. Sharing them with the internet. Hold me to this, I have been posting lots of photos but more ideas need to be flowing from this space. Posted December 29th, 2006 by Ms. Jen & filed under design + web, tech + web dev. The design-o-sphere is in a twitter about the Photoshop CS3 Beta icons, but I am here to tell you that icons be darned, the real problems of the beta version is in the interface with one’s Wacom tablet. The tracking between my Wacom’s pen tool and the actual mark made on the Photoshop CS3 beta image is faulty at best. I have spent two nights drawing on my Wacom tablet with Photoshop CS3 Beta and making a lot of messes, as 1/4 of the time the mark is made at least 30 pixels from where the pen was previously. A big jump with no lifting of my hand.. I have cross tested on Fireworks 8 and Photoshop CS2 with no troubles. Hopefully, Adobe will have this ironed out before CS3 goes to market. On the good side of CS3: the glory and heavy lifter of the Photoshop CS3 Beta is the “Quick Selection Tool”. Drool. Knock out whole sections of unwanted bits and then use the “Magic Wand Tool” for the fine tuning of your selection. Happy days. Posted August 24th, 2006 by Ms. Jen & filed under design + web. Jessica Helfand at DesignObserver has written on The Ovalization of The American Mind. One can imagine buttons being scaled to the oval circumference of an average adult fingertip, but recently it seems that the propensity for ovals has resulted in a morphologically compromised landscape of soft shapes and rounded edges. And nowhere is this more noticeable than in cars, which (with a few exceptions) have enthusiastically embraced everything rounded: fenders, dashboards, you name it. While I’m not advocating a market for squared-off odometers, it is difficult to find a car these days that doesn’t look like a cartoon. Ms. Jen echos: it is difficult to find a website these days that doesn’t look like a cartoon. While Ms. Helfand uses contemporary car and thornamental design to illustrate her points, my mind kept wandering to thoughts of the ovalization of web design. While most of the current crop of Web 2.0 web design is keeping within the ideals of geometric modernism and avoiding thornamental-ism, the oval has landed and many sites have the stylized appearance of a darkly lit neon cartoon. I do like that designers are breaking out of the box, even ovalizing their box model, but when a web design trend takes off it really takes off and the oval, rounded cornered, neon bevel is in full flight.